Pet peeves: Indecisiveness, when people don't vote, and when people don't like dogs. I was elected to serve over 15,000+ students at Stanford University as Student Body President, and I was the first Latina to hold the position. My parents. They have both worked incredibly hard for everything they have and to make a good life for us kids. Because of them, and their never-ending love and support and belief in me, I have been able to accomplish everything I've ever set my mind to. A copy of Maya Angelou's "Still I Rise," a poem that sums up my mindset for life and Survivor. A radio so I could listen to the news every day. Not knowing what's going on in the world around me is going to be one of the hardest parts of the game for me. And make-up. I'm not going to front, I wear it every day. 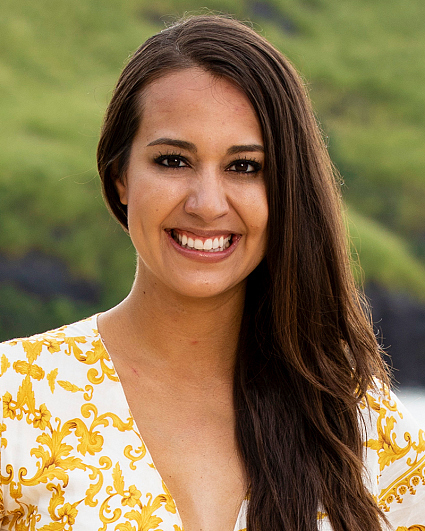 Natalie Anderson for her intellect, sense of timing and character. Parvati for her charm, social awareness and cunningness. And both women for their warrior spirits and overall badassness. Survivor is the ultimate challenge of grit, savviness, and strategy. As a naturally competitive person, I want to test myself, my abilities and my limits. As a military spouse, I believe we are most of the strongest and most adaptable people. I want to win because my husband will head out on his second deployment this year, and I want to be a source of strength and inspiration for other military families who have endured long months and years away from their soldier. Also, winning a million dollars is obviously a huge motivation--like many Americans I have a lot of student debt from school, and being able to pay that off would be a game changer. I have always been an extremely optimistic and positive person, I always see the best in everything/everyone and make the most out of even the hardest situations. Even though I'm not super outdoorsy, I'm a quick learner and always down to try something new. I'm also scrappy, adaptable, smart, fun, and determined as hell. Most importantly though, my love for people, empathy, and emotional awareness are what I credit for much of what I've accomplished in my 28 years of life. I'm able to get along with anyone, and people tend to trust me. Lastly, I'm not afraid to take risks and play hard. I will use all of these skills, at the right time with the right people, in order to make it all the way to the end.